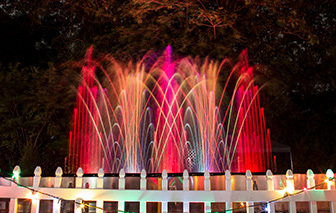 The “liquid fireworks” show brings to life a brilliant display of lighted dancing water to holiday music. More than twenty acres of gardens are lit up for the holidays with hundreds of dazzling lights. 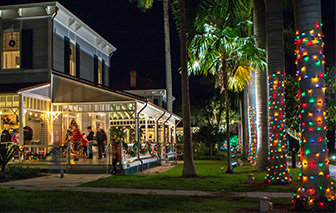 The Edison and Ford Estate homes will be traditionally decorated for the holidays. 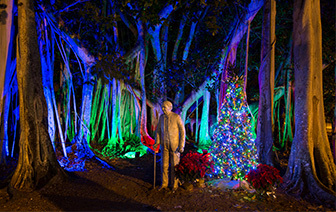 Edison Ford Holiday Nights opens the night after Thanksgiving, and runs through December 30. 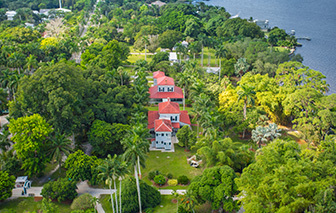 Situated riverside along the Caloosahatchee, the Edison and Ford Estates include twenty acres of gardens, nine historic homes, the original Edison Laboratory and a Museum filled with exhibits, galleries and inventions. The Edison Main House included a formal living area, master bedroom and bath and children’s bedrooms. The furnishings inside the homes and porches are original to the estate. 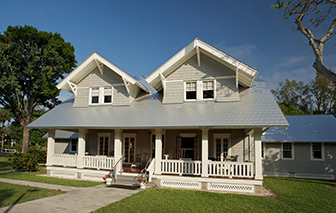 The Ford family purchased the Craftsman style home in 1916 and vacationed no more than two weeks a year in Fort Myers. 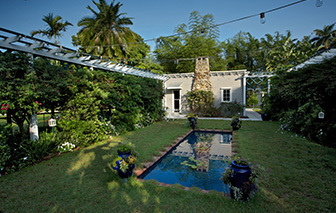 The house was sold in 1947 to a private family who sold the property to the City of Fort Myers in the late 1980s. The house opened to the public in 1989. 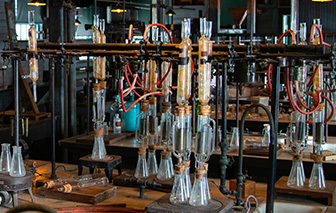 The Edison Laboratory is filled with original equipment and machinery used by Thomas Edison and his “muckers” in his quest for a source of natural rubber. The Laboratory was designated a National Historic Chemical Landmark in 2014 by the American Chemical Society. 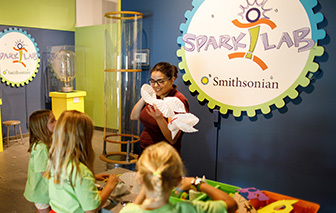 The newest exhibit in the Edison Ford Museum, Spark!Lab is a hands-on, interactive exhibit for families and children. The exhibit was installed in collaboration with the Smithsonian Institution. 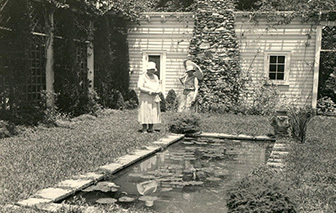 Mina Edison and her daughter in-law Caroline Edison enjoyed the Moonlight Garden, designed by one of the first woman landscape architects in the country, Ellen Biddle Shipman. 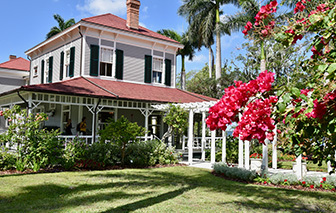 The Edison’s often used the garden as an outdoor entertaining area. 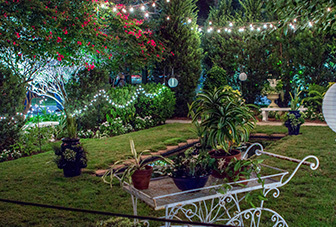 The Edison Moonlight Garden was designed to be enjoyed in the evening; the rectangular pond reflects and mirrors the moonlight; the aroma of fragrant plants and shrubs fills the air, and moon beams absorb into the silver, blue white flowers. The garden is a popular spot for intimate weddings and gatherings. One of the only formal gardens on the site, the Moonlight Garden is a favorite with guests and has been restored to reflect the 1920s design of landscape architect Ellen Biddle Shipman. 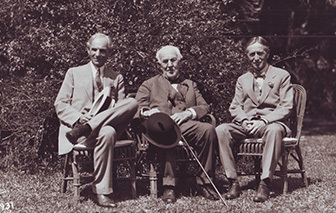 Henry Ford, Thomas Edison and Harvey Firestone outside of the Edison Botanic Research Company Laboratory in Fort Myers, Florida. The men were searching for a natural source of rubber after WWI. Edison tested more than 17,000 varieties of plants in the Fort Myers lab. 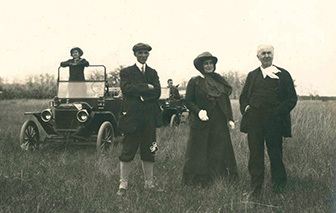 In 1914 Clara Ford, Henry Ford, Thomas Edison, Mina Edison and other family members set out for a camping adventure in the Florida Everglades. 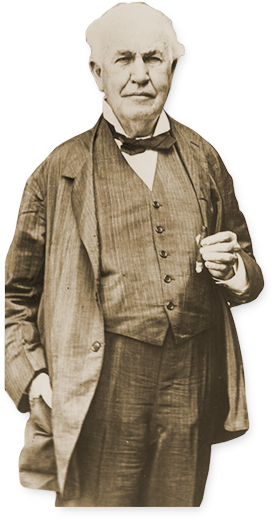 Ford and Edison would continue camping trips inviting Harvey Firestone and John Burroughs to join them for the next ten years. 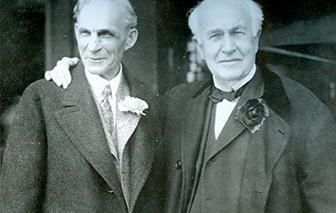 Good friends, Henry Ford and Thomas Edison in Fort Myers, Florida in 1927. 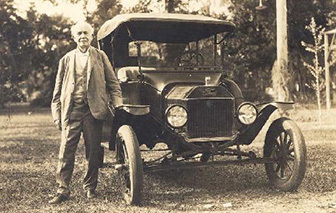 Edison Ford has a large collection of contemporary and historical photos in our archives. your need in the Additional Image section of the inquiry form.